Released earlier this year to critical acclaim but a limited nationwide run, Stake Land is yet another log in the all-consuming fire that is American Obsession With Vampires. But instead of the camp (True Blood), melodrama (Twilight) and overblown Stephen King copycatting (Justin Cronin’s 766-word 2010 novel The Passage, the first of a trilogy whose film rights have already been gobbled up) that goes with what vampires have become in popular culture, Jim Mickie’s film sticks pretty close to the grim, dread-soaked reality of Cormac McCarthy’s The Road. The surviving humans in post-vampire-apocalypse America are just as scary as the various forms of the fanged undead—the particularly pesky breed of beserkers are the hardest ones to kill, apparently—and winter is on its way. A teenager whose parents were killed by vampires runs into a loner known only as Mister, who has stayed alive simply because he stays by himself. The two strike out together in Mister&apos;s convertible to find a safe haven free of vampires, but when they run into other living people, including a fanatical religious cult, things get pretty Texas Chainsaw Massacre. 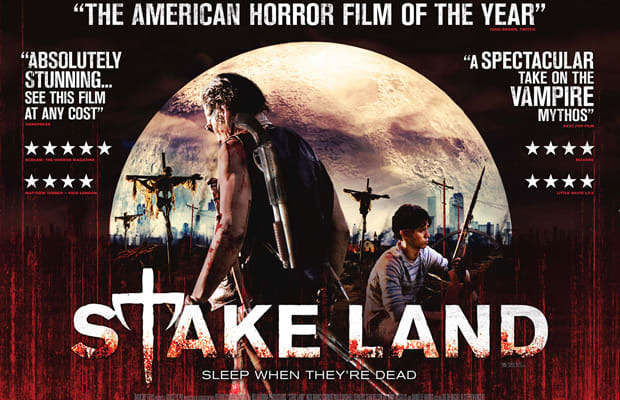 As the city&apos;s free summer movie screenings at Tompkins Square Park come to a close, greeting the coming cold months with a good scare like Stake Land is a fitting end.